DESCRIPTION: Have you ever heard someone say they don’t like wild game because it tastes too “gamey”? Learn to tame the gaminess with tips and techniques that get your game successfully from field to table and make meals you’ll be proud to serve family and friends. Topics covered include game care, processing and storage; proper use of spices and marinades and the differences in handling and preparing wild game vs. domestic meats. 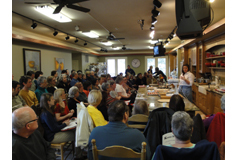 Numerous recipes will be demonstrated and participants will be able to sample each of the prepared dishes.